Kids bible lessons can help you teach children about hospitality, kindness and selflessness. Bible study for kids does not have to be a bore! A great way to turn bible stories for kids more exciting is by relating them to the child's everyday life. By connecting it to situations taken from the world of the child you have a better chance of reaching the child and getting your message across. Abraham was living in the promised land with his wife Sarah. One day while he was sitting outside his tent, Abraham saw at the distance three men walking towards him. He run towards them and invited them to come and rest in his tent. Even though the men were strangers to him, Abraham showed them great hospitality. He immediately had water brought to them so they could wash their feet from the dirt of the desert and he asked his wife Sarah to prepare them the most elaborate and delicious meal. Abraham was kind to the men without knowing that in fact they were three angels. Messengers from God. At the end of their visit the men told Abraham that in one year Sarah will give birth to a baby boy. Sarah, who was inside the tent overheard the men and laughed thinking she was too old to bare children. As predicted by the angels one year later Sarah gave birth to a baby whom they named Isaac, which means "may God smile." This story has two important lessons that we can teach our children. The first falls under the category of 'the way of the land'. 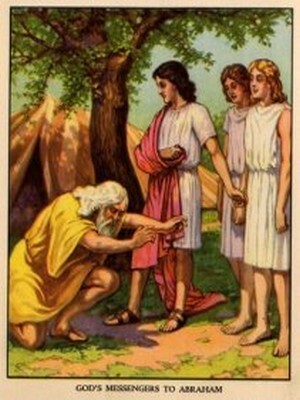 Abraham shows us in his actions how people should behave to one another. In his great hospitality he teaches us the importance of kindness. - Asking our guests if they would like something to eat or drink. - Showing them around our home so they will feel welcome and comfortable. The second lesson in the story reminds us that God is all powerful. We are told that Sarah was ninety years old when she gave birth to Isaac and Abraham was one hundred years old. It was a true miracle made by God.